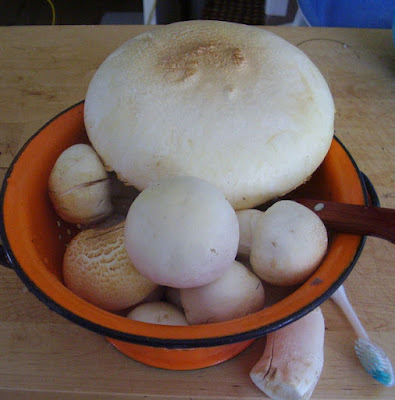 The Cook's Corner Blog: The Horse Mushroom Race: There's A New Competitor! The Horse Mushroom Race: There's A New Competitor! Horse Mushrooms. Yes, the big one is over 6 inches wide! The friend with the property for sale called to say more horse mushrooms (agaricus arvensis) had sprung up in the lawn and I should go and get them. But when I got there, oh horrors, some thief had come and cut off all their heads, leaving all the stems. My first reaction was, how stupid, there's so much meat in those stalks. My second reaction was, OMG, I've got competition! I drove around to all my secret horse mushroom places, and the thief had done the same to most of them. I managed to rescue the ones in the picture above, including that huge specimen. I hope the thief doesn't like shaggy manes. They should be up soon. P. S. Mushroom recipes are in this post.